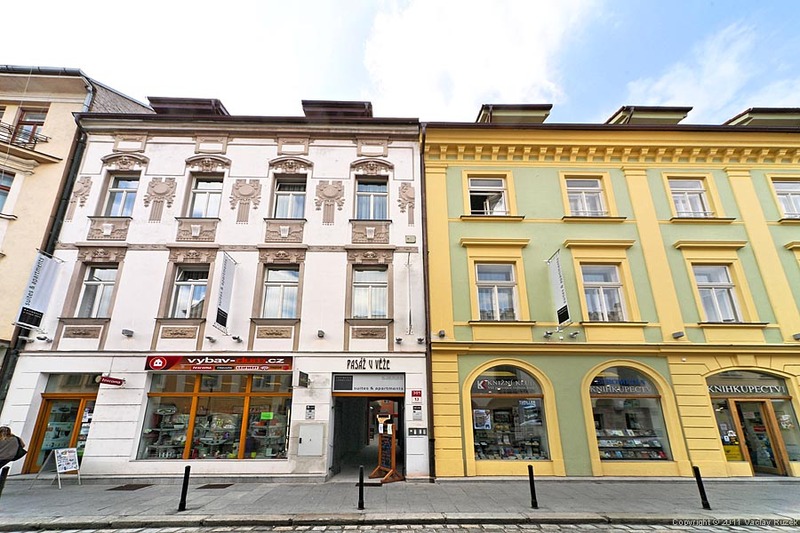 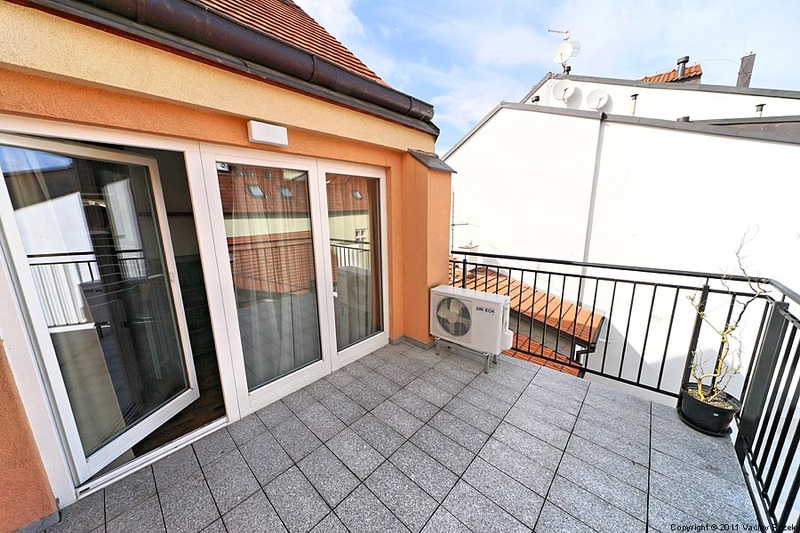 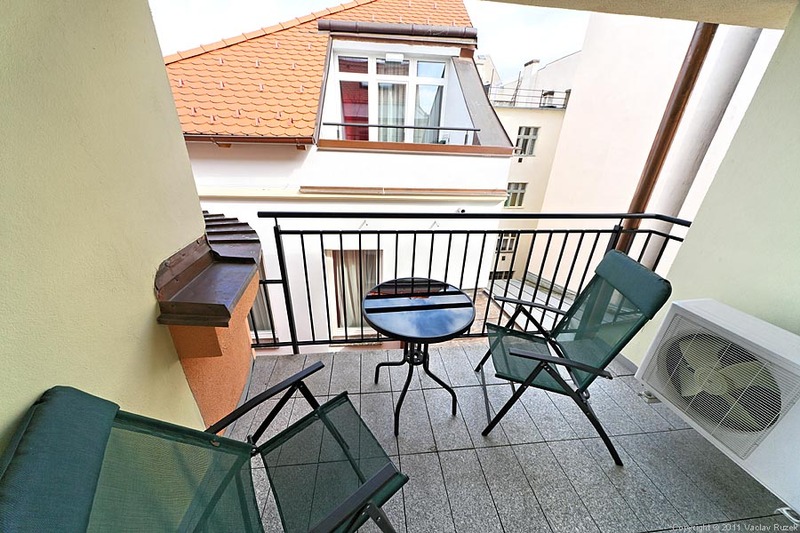 Residence At The Black Tower is located in center of Ceske Budejovice and offers short and long term accommodation in fully equipped double rooms and four suites some of which are duplex or terrace. 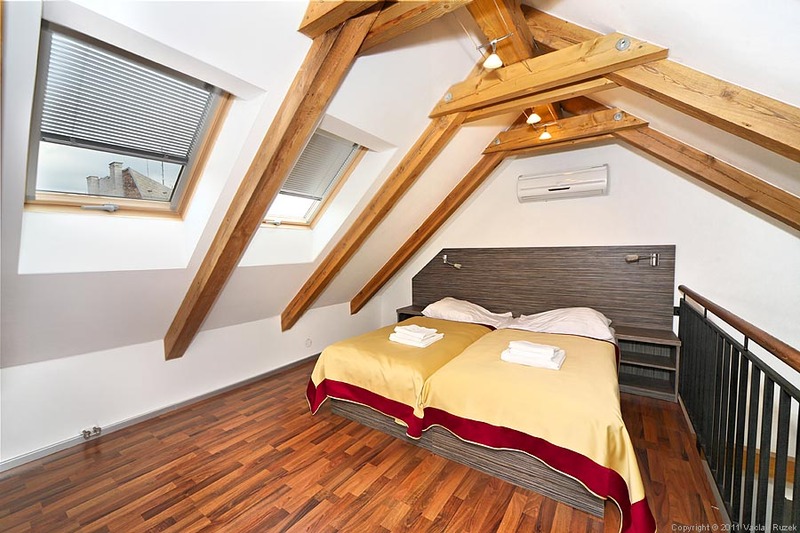 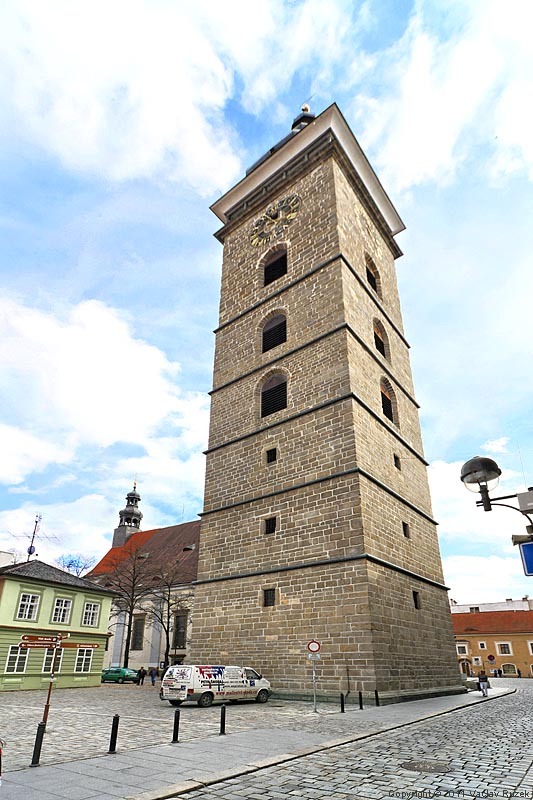 The residence is located right in the historic heart of the town, at the Black Tower, in the sight of the square of Premysl Otakar II. 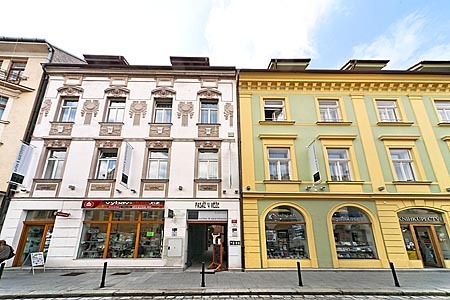 All major city sights as well as gourmet restaurants Symbiosa, Masné krámy, Malý pivovar etc. 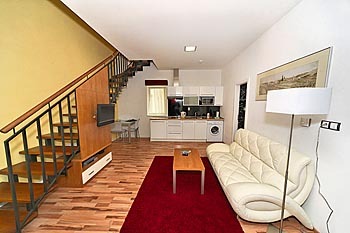 are just a few steps away from our residence. 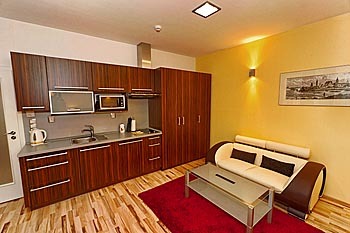 Our designers put their big effort into combination of modern comfort with practical style solutions. 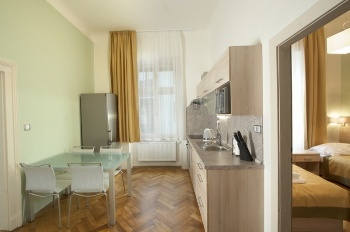 Luxury living and comfortable home environment does not harm the unique historical atmosphere of the complex. All you need you find here in one room: - 2 comfortable beds, cosy sofa, dining table with chairs, working table with lamp, fully equipped kitchen, satellite TV, radio-CD player. 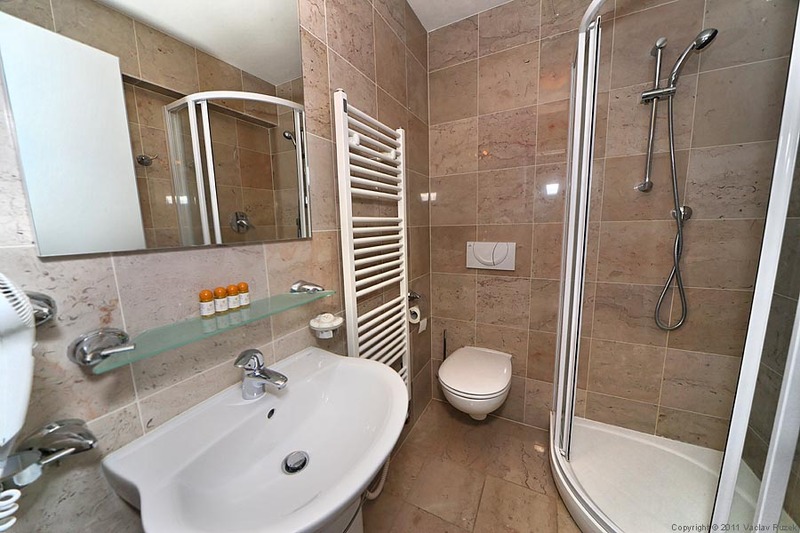 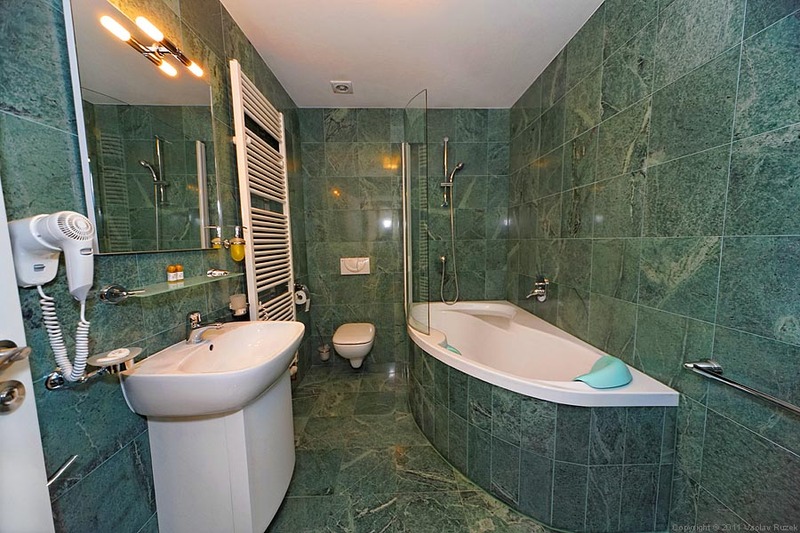 There is also entrance hall with wardrobe and bathroom tiled with genuine marblestone with bath-tub, hair dryer etc. 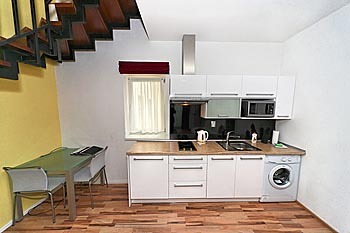 There is also washing machine. Fully equipped luxury apartments are ideal for a couple or two people - as the bed can be used as double-bed or two single beds. The living area is connected to a dining area with fully equipped kitchen, where can be found hob, oven, fridge with freezer, dishwasher, washing machine, microwave oven and electric kettle. 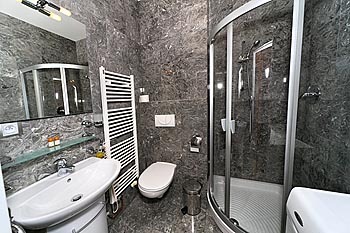 The modern bathroom is made of natural stone and equipped with shower or bath, toilet, heaters, towels, cosmetics and hair dryer. The foyer leads into the cozy living area overlooking the ancient city streets. The interior is modern and comfortably furnished with a large sofa, coffee table and technical equipment, including satellite TV, CD-radio and internet connection. 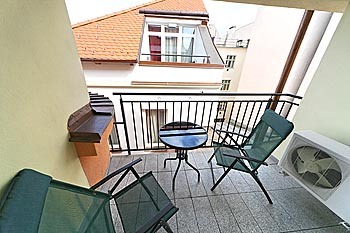 Atypical apartment with air conditioning is located on the top, third floor. 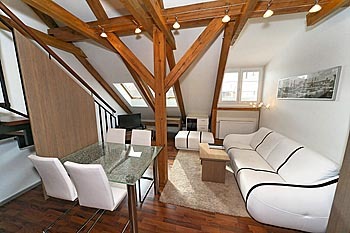 After renovation has retained many of its original features, such as wooden beams, which, in combination with modern design creates a unique whole. 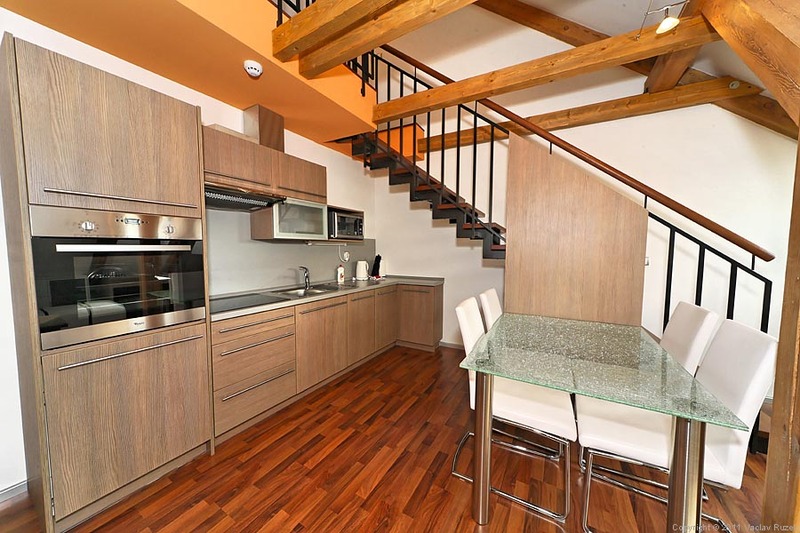 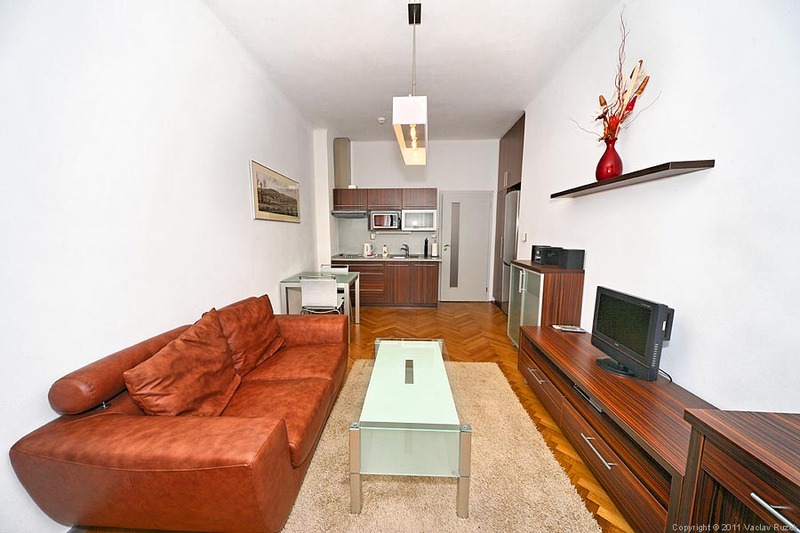 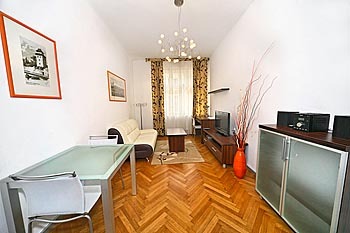 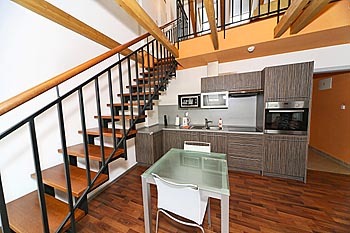 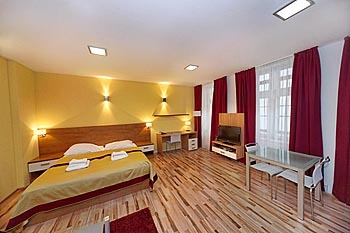 Apartment offers an open concept of living room, dining room and kitchen which is fully equipped. The living room has a sofa, in the attic bedroom is a large double bed. 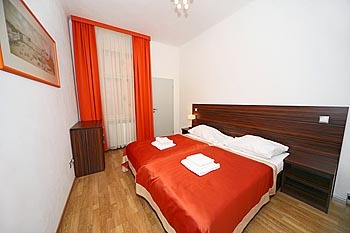 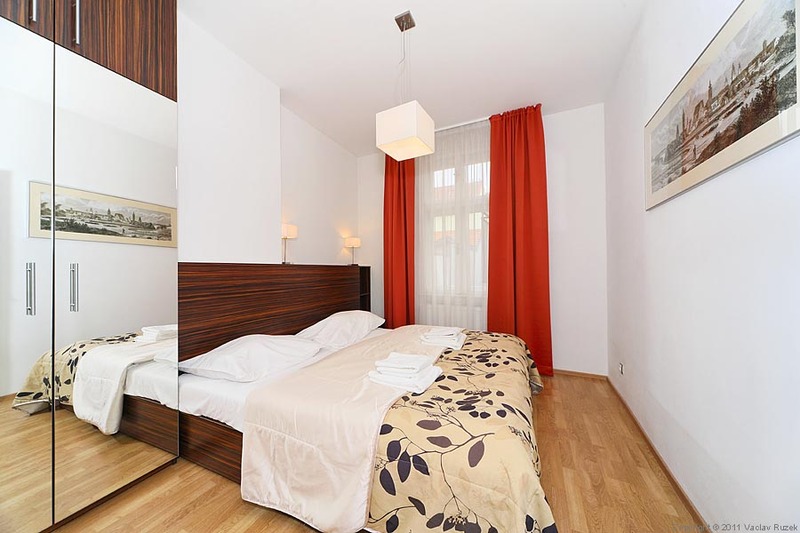 Apartment offers internet connection, satellite TV, radio and direct dial telephone. 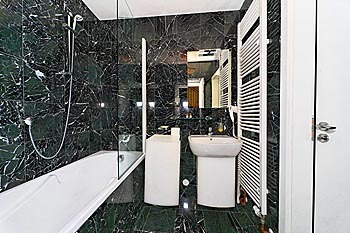 Bathroom is tiled with genuine marble stone and equipped with baththub, toilet, heaters, towels, cosmetics and hair dryer. 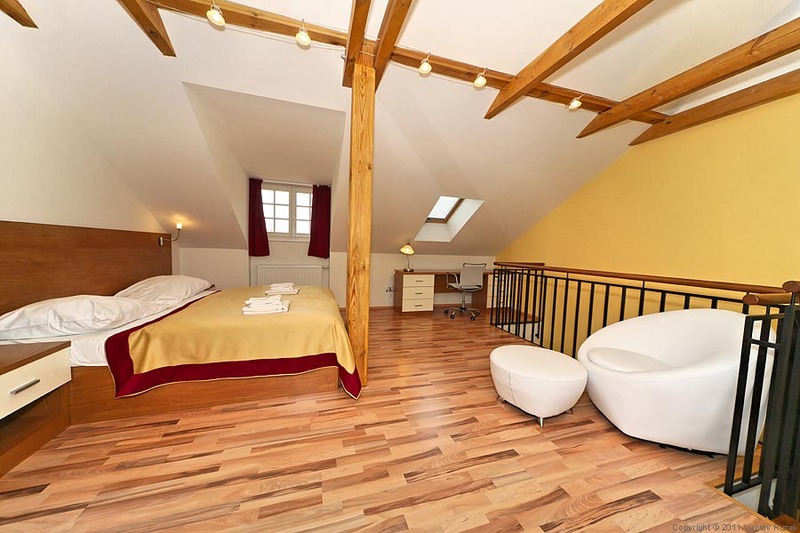 These luxury apartments are the most romantic for a couple and most comfortable for two people (the beds can be used as double-bed or two single beds). 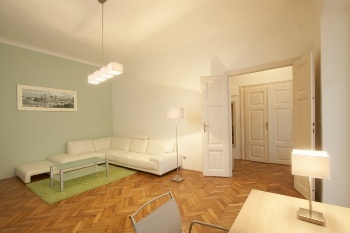 The foyer leads into the cozy living area with big windows to the quiet courtyard. 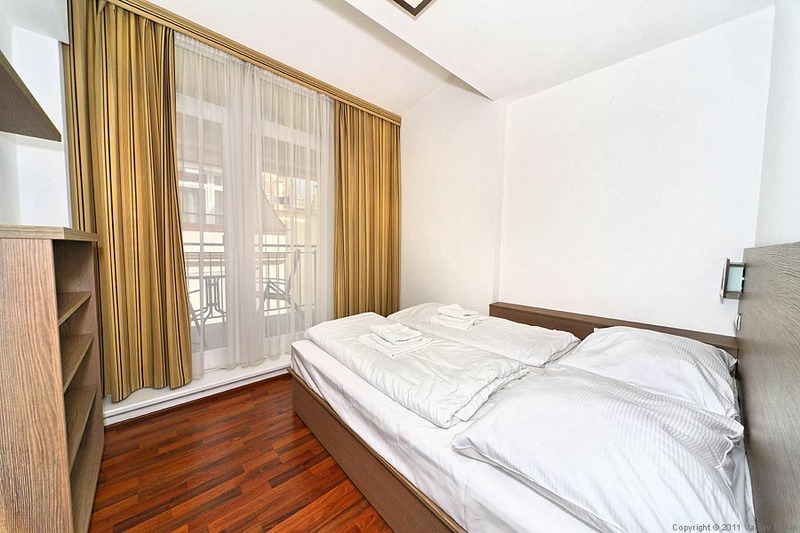 The interior is modern and comfortably furnished with a large sofa, coffee table and technical equipment, including satellite TV, CD-radio and internet connection. The other part of the room includes dining area with fully equipped kitchen, where can be found hob, oven, fridge with freezer, dishwasher, washing machine, microwave oven and electric kettle. 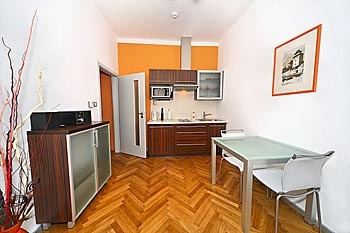 Adjacent is the the dining area with big table. The modern bathroom is made of natural stone and equipped with shower or bath, toilet, heaters, towels, cosmetics and hair dryer. Going further inside, you will come to the two separate bedrooms, both of them having its own "walk-in" wardrobe and overlooking the old-town street. 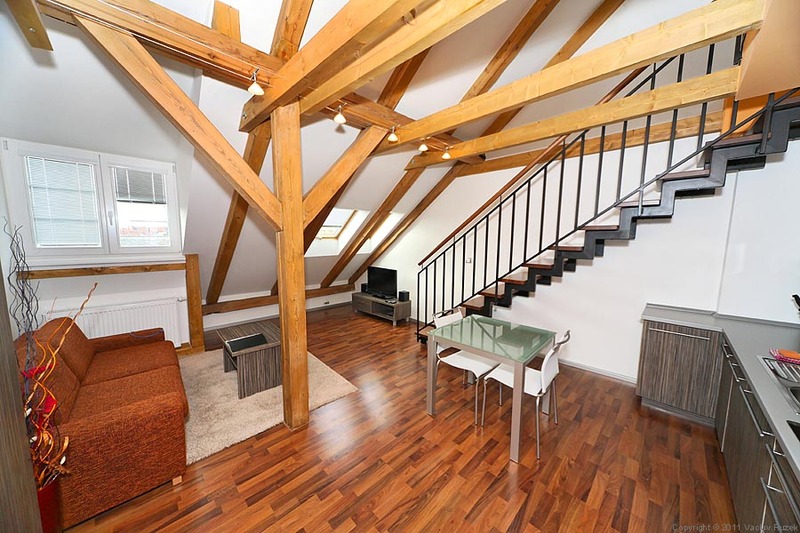 Impressive character of the interior is augmented by wooden beams under high ceilings. 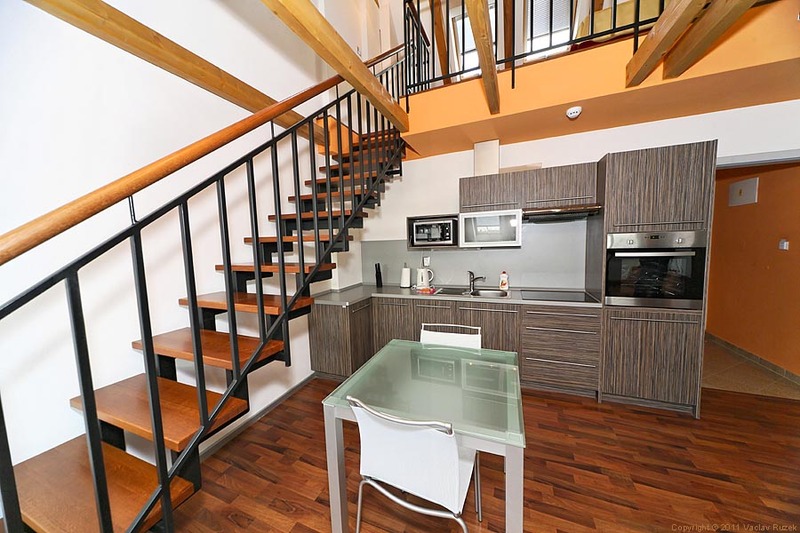 On the lower floor can be found living area with TV with satellite channels, radio, direct dial telephone and internet connection, dining area and fully equipped kitchen including hob, oven, fridge/freezer, dishwasher, microwave oven and electric kettle. Double bed with bedside tables dominate the bedroom, from there you can enter to a private terrace. 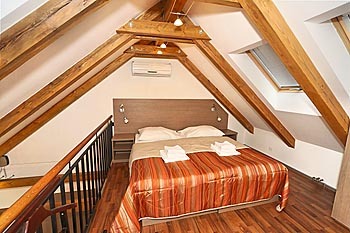 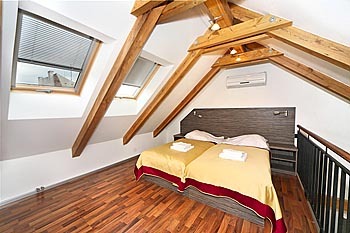 Another bedroom is located in the attic area. 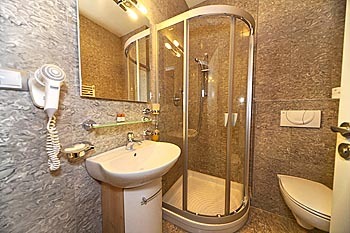 Marble bathroom is equipped with shower, toilet, heaters, towels, cosmetics and hair dryer, there is also a washing machine. 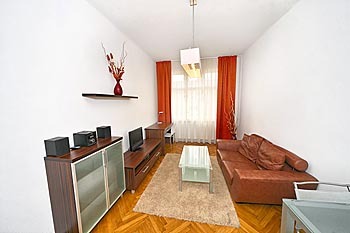 All these apartments are air-conditioned. 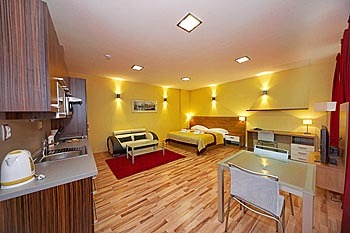 Hi-end of the accommodation range for an unbeatable price! 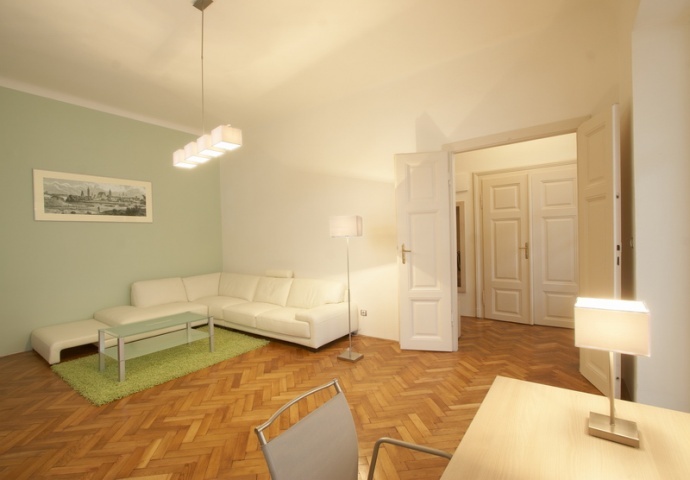 Luxurious apartment with more than 100 sqm.Two bedrooms. Two bathrooms. Big entrance hall with "walk-in" wardrobe. 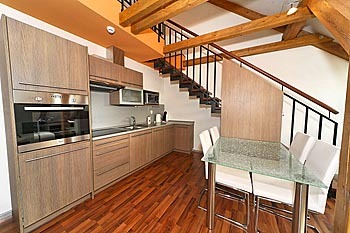 Separate kitchen with family dining table.Loggia with with wiev to the calm courtyard. or in underground garages for 250 CZK per day.